I always want them to be creative, but I don't like the headache of cleaning up after them. 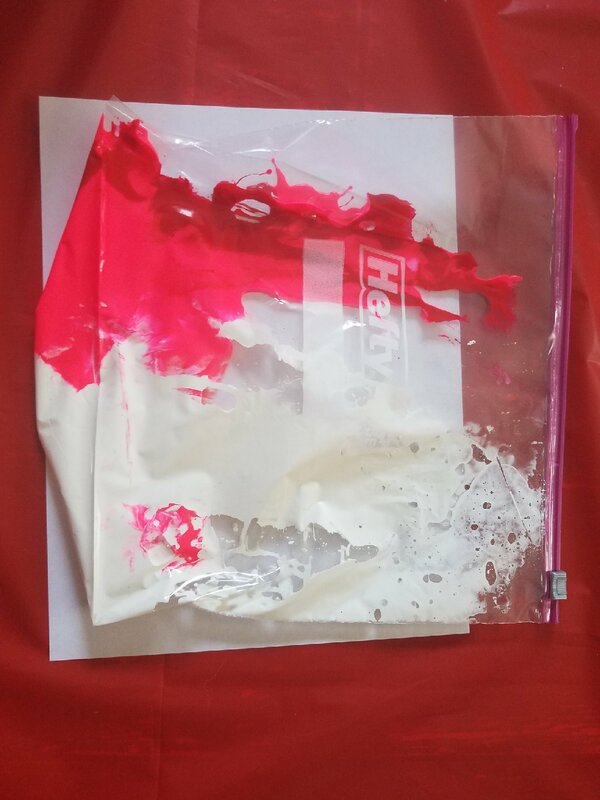 Imagine my delight when I first heard of suggestion of painting in a bag. "What's that?" you ask? Oh, it's so simple! You literally put paint into a gallon bag and then let your kids move it around. 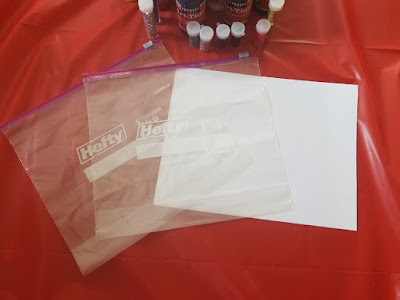 Clear Gallon Bags- I find that those that zip work better because they seal better. White Sheet of Paper- I used computer paper, but any sheet of paper will work. Tape- (optional) Masking or something wider than clear tape works best. 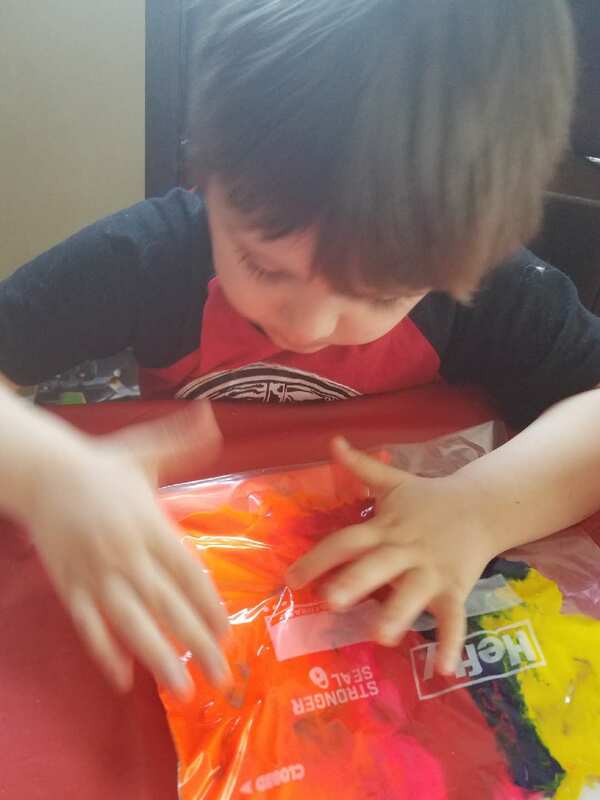 Step 1: Pour in any colors that your child likes. Try to keep them separate from each other so your kids can work them together. Add colors that blend into different colors. Ex: Pour red next to yellow for orange. 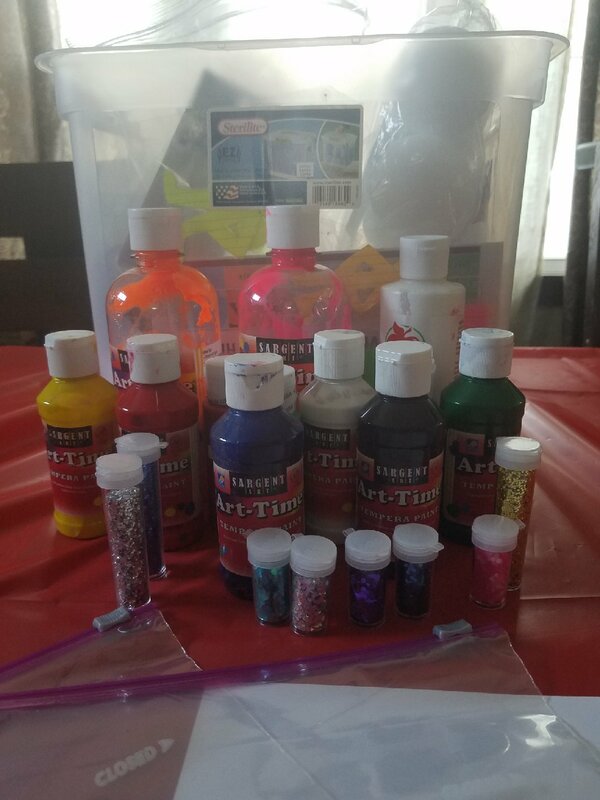 Add glitter, if you'd like, but you'll need a lot of it to show. My daughter wanted pink and white so she could make a lighter pink. Step 2: Seal the bag and tape over the white piece of paper. The tape is to hold the bag in place. I skipped this step because I misplaced the tape. The paper is there to help as background of sorts. 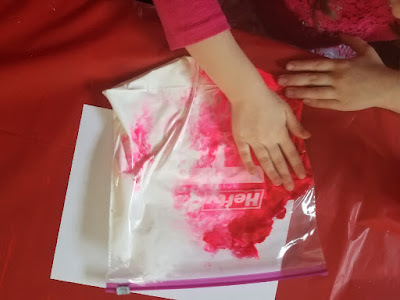 Once your child has finished blending, they can run push the paint around and make "pictures" with the white background. This is an activity that my kids like to do. Unfortunately, now that they are older, it doesn't hold as much appeal for them as it used to. My daughter who is seven likes to play with this for a few minutes before wanting to paint "for real". Perhaps if I had more of the other colors that she likes, she would have played longer. My youngest who is four, still enjoys doing this more and spent more time playing with this. I think that if we were in the car, traveling, this would be a huge time passer as long as the paint stayed in the bag. Are there any tips that you'd recommend? Are their similar projects that you've done before? As always, if you like what you've seen here, please share with a friend and sign up for emails! 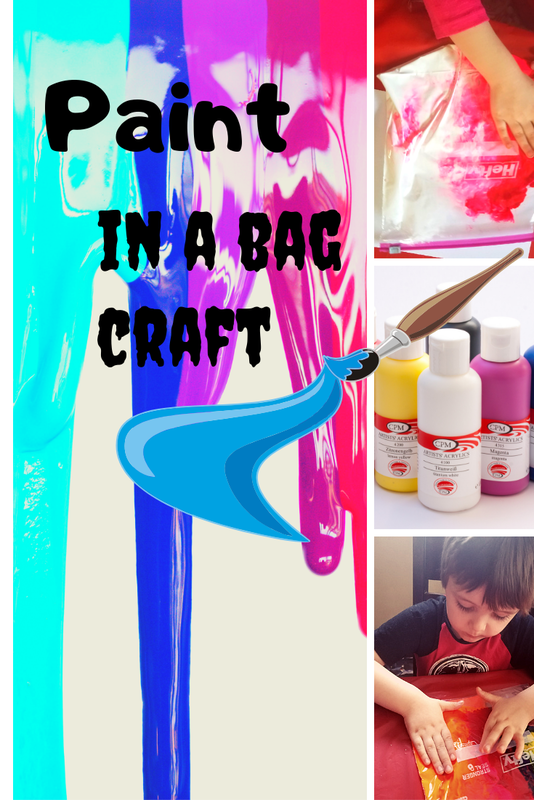 A simple activity that can set the imagination of the little ones in motion with the colors! Its so easy to do, too! 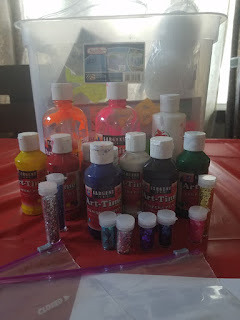 What a fun activity to do with young kids. When my kids were younger I used to put a table in the backyard and just hose it all down when they were done. In the winter that wasn't possible. This is the perfect solution. I've never thought to take a table outside, before. Thanks for the suggestion! This is so so cool! I will definitely buy the paint in bag for my nephew, so cool. Thanks a lot for the recos. I used to do this with the kids I nannied and they LOVED IT!! 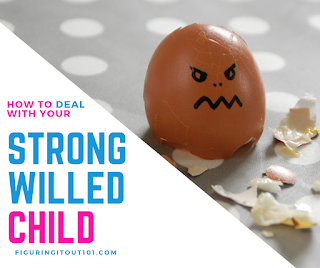 I’d highly recomend this to anyone who has/works with small children. Great job explaining the activity and super cute pictures! I'm so glad to hear that! Thanks for sharing! 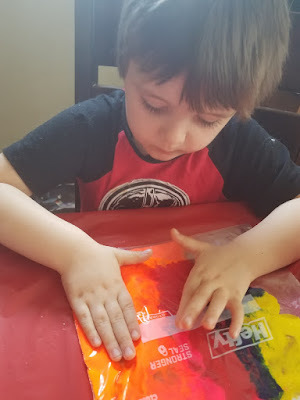 This is a really unique idea, a form of finger painting without the mess! Love it. Will file away as an idea to use with future grandkids! It's great for the littles and as they get older, you can promote them to finger painting or regular painting. My kids would love to do this craft! Perfect for all the rainy weather we've been having. It's been snowy, here. I should find an eco friendly mixture and have my kids paint the snow. Oh, wow! That is so so cool! I am going to share it with my nephews and nieces. 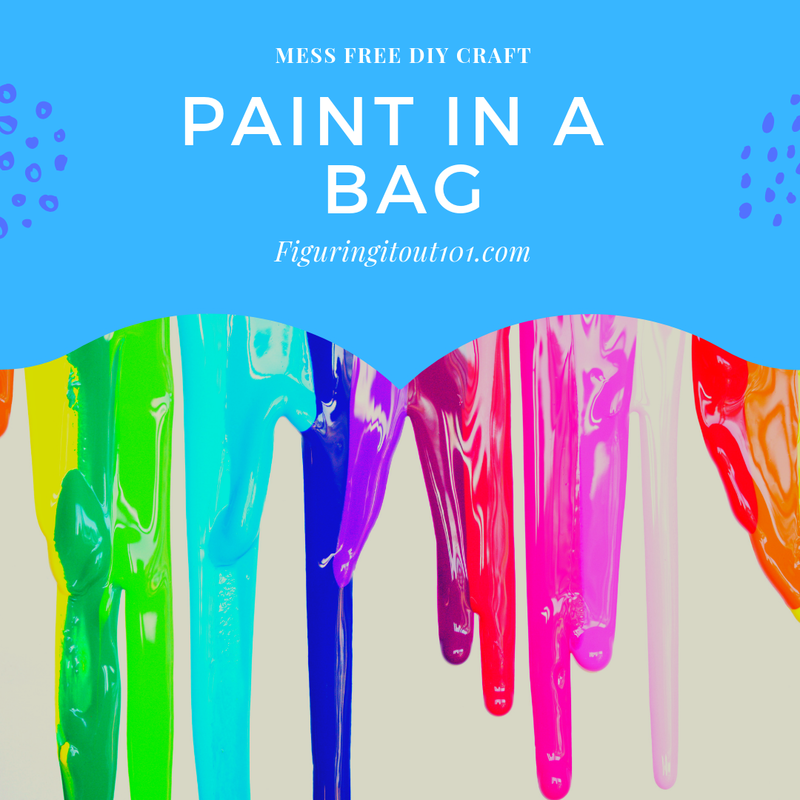 Paint In A Bag is a good idea to come closer with the partner emotionally. Looking forward to really new cool ideas from you. My niece is really into art so I bet she would enjoy this activity. She's also a little messy, which makes this even better. Okay, this is absolutely genius! I can definitely see myself doing this with my nephews. They would have a blast! Thanks! Unfortunately, I can't take credit for it, but it's good to know that someone else thinks it's genius too! This is a really great idea! My boys would love making these and playing with them. They would have so much fun with this and I think I would too. It's fun for adults, too! There's something therapeutic about pushing paint around. This is what my kids would love to have. Painting in a bag is a new idea. I'd always been reluctant in giving paint to kids but this product has relieved my worries. 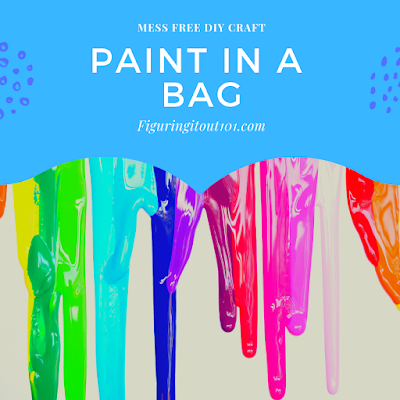 Since the paint is inside the bag, you don't have to worry about a huge mess or them eating the paint. The first time I tried this my youngest had just turned 3, so I was worried about that. I like that it is mess free. I'd love to do this with my granddaughter. I hope that she'll have fun! I love this activity idea! Less mess but I think my kids would enjoy this. Wow, that looks like it would be so much fun! Thanks! This is definitely a great idea and it will be really fun. Thanks for sharing. It's something that my kids have fun doing. Great post here! We've got plenty of little nieces and nephews who'll benefit from this for sure - sent it to the parents as well! Oh great! Thank you! I hope they enjoy it!